- Designate a sober driver. - Plan safe parties, including providing non-alcoholic drink options. - Be prepared to get everyone home safely. - Remember that using drugs and driving has the same risks as alcohol use. 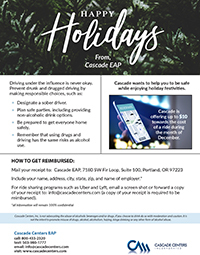 Cascade wants to help you to be safe while enjoying holiday festivities and encourages the use of Taxis and Rideshare programs. If you or a loved one have been drinking, please be responsible. Download the flyer to the left for more information how Cascade can be of help this holiday season.